Once upon a time, all we had to remember was a four-digit pin number to access bank accounts via an ATM. The internet has changed our lives and the way we conduct our business and our personal lives. Most people who have fully embraced this technology have to cope with a whole raft of passwords designed to protect our personal security and private data. 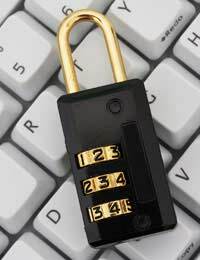 The passwords are vital and need to be chosen and protected with great care. Before you start creating a new password bear in mind a very simple rule: the word must be easy for you to remember but hard for any third parties to decipher. Password is a bit of a misnomer, it’s really a seemingly random combination of numbers, letters and punctuation or symbols. At least that’s how the ‘password’ will appear but to you it’s anything but random. If it was truly random, it would be almost impossible for you to remember one password, let alone any others. When you choose a new password for an online account or facility, a lot of websites now have password checkers. These are very useful and reassuring. Don’t ignore them! As you type in your new password, it will tell you whether your choice is weak, average or strong. You should amend your choice based on its advice. Creating a new password is like following a simple formula. For example, John Smith wants to set up a new online shopping account with a supermarket. He needs a password. choose a phrase or sentence that means something to him and perhaps relates to the account he is opening. For example, he could decide on ‘I hate shopping, that’s why I shop online.’ Don’t choose a well known phrase or idiom, keep it personal. The next job is to take the first letter of each word and translate it into an acronym (a word made from the first letters of another set of words). This gives him the word: - ‘ihstwidio’. ihstwidio already looks like a good password but it could be improved. Start by adapting some of the letters to upper case. Think of a rule you’ll remember to do this. John could choose to make all vowels upper case. This now gives him ‘IhstwIdIO’. This looks like a really good password now. The next step is adding some digits. Pick a digit that means something to you and add it at the end beginning of middle of the password. John’s lucky number is 13, so he’s going to make his word ‘IhstwIdIO13’. The final step is some punctuation. In this case John imagines his original sentence would be an exclamation, so his finished password is: - IhstwIdIO13! By following these simple steps, John Smith has created a password that’s easy for him to recall and very difficult for anyone with negative intentions to decipher. Follow the same set of rules to create your own passwords. Find a relevant sentence. Create an acronym from the first letters of each word. Devise a simple rule to change some of the letters to upper or lower case. Add a relevant number and finish with punctuation. Once you’ve chosen your passwords, your next job is to protect them from others. Don’t use the same password, once the word or combination has been uncovered you will expose your entire range of accounts. It seems unbelievable but it’s surprisingly common for people to write passwords down. It’s essential that they stay in your memory. As long as you follow the formula for creating passwords, it’s possible to have a number of complex yet easy to recall passwords that are totally secure. The minute you keep a physical record of them you compromise your security. When selecting passwords, remember to steer clear of any numbers or words that relate to your personal data. It’s common practice for thieves and thieving software (malware) to pick up on this date and to use it as the starting point for deciphering your password combinations. When you use any computer, especially one that is used by other people, you must make sure you log out of the computer. Within your individual set of files, some computers keep records of passwords used. This also applies to any sessions you have online. To create your passwords, make sure you follow a clear step by step process. It’s a simple idea that produces complex results. Keeping it simple also means that you can ditch paper reminders and keep your passwords where they belong- in your head and your head only!